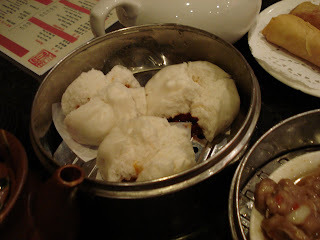 It wouldn’t be a vacation without an attempt at Dim Sum, and at the suggestion of chowhound, Ping Pang Pong was my Dim Sum restaurant of choice. 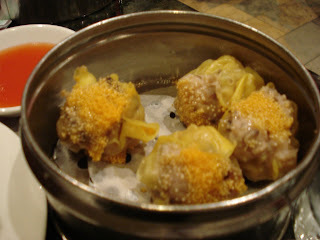 I know that I’ve eaten at a number of casinos, but dim sum at a casino just doesn’t seem to make sense. Dim sum needs to take place in a large building, full of loud noises, delicious smells and a sea of people waiting to choose their meal from the steam carts. Ok, maybe a casino satisfies most of those criteria, but it’s still a little weird. 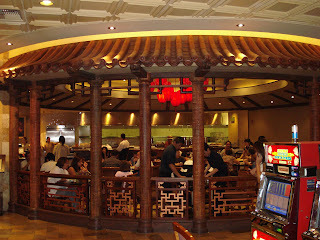 Just a dim sum place in a casino, why not? This was new to me. 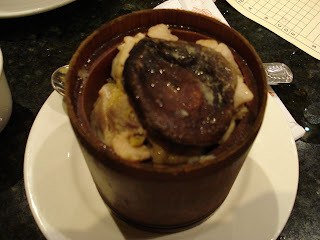 They called it Peking Rice, and it was a bamboo cup filled with rice, chunks of chicken and topped with a black mushroom. Michael wasn’t a fan simply because he doesn’t like the idea of eating around bones. I liked it, it had a great ginger flavor that went well with the chicken. Siu Mai, Har Gao, and Pork Spare Ribs, pretty standard fare for dim sum, and a good litmus test for a restaurant, these passed the test, although I’m not sure what the little yellow dots are on the siu mai, maybe mustard seeds? One of my absolute favorites, the fried crab claw, or yeung hai keem. 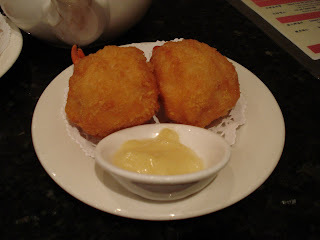 It’s a crab claw with a mixture of shrimp and crab molded around it and then fried. 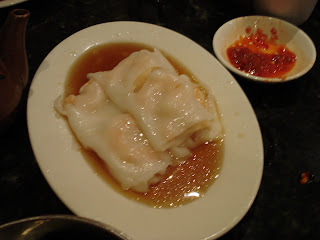 Shrimp crepes or rice flour shrimp (I’ve heard both), a tricky dish to eat without making a huge mess. I liked the fact that PPP used pretty big shrimp, a lot of times people try to use something as small as krill. 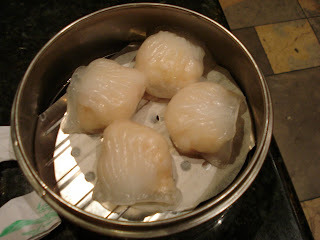 These are a recent addition to my list of favorite dim sum. 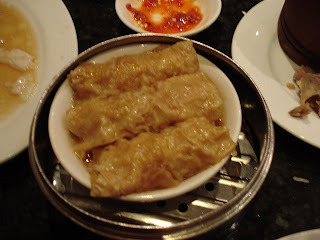 I never really known the name for them, but according to a little web searching they go by bean curd rolls or san juk geun, either way they’re a fantastic little dish. 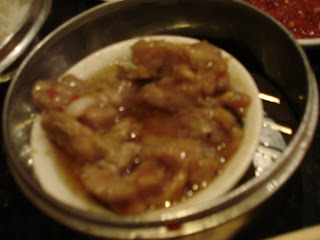 Its bean curd wrapped around pork or shrimp fried and then steamed. 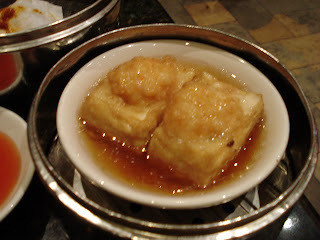 A new one for me, it was a thick slice of tofu with a shrimp on top that had been fried and then steamed. A little hard to keep in one piece, but a solid selection. 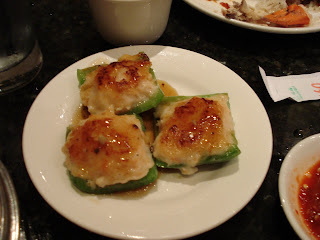 Ubiquitous, that’s how I describe pepper shrimp when it comes to dim sum, and it’s always my luck that the fresh ones come out after I’m done. Michael and I caught the cart just in time and these were great. A crisp pepper with fresh shrimp and delightful sauce, a great way to end the meal.